I first learned about fabric pot gardening while reading a Wizzley article written by someone who also loves growing things. On his page he suggests growing potatoes in a pot made of black fabric or burlap. Instantly, I loved this idea! I don’t have to dig up the ground and get it ready to plant – whoo hoo – I hate that part of gardening. I ordered three yards of compost / loam mix to add to all my garden beds and just used some of it to fill my black fabric bags. The one on the left in my picture has potatoes and you can see one sprout shooting up through the dirt. Once the shoots grow to 6 or 8 inches I will add more dirt. The other pot has carrot seeds. I figure they might do well in a good bag of soil instead of in my yard. It’s always a chore to get the garden areas ready for planting. I started at this house with an overgrown backyard so my first year here was spent clearing out the weeds and blackberry bushes. Last year I expanded the garden area and added good dirt. This year I am adding more dirt, but it’s easier to add it to bags and the chance of weeds invading a bag is minimal. My backyard is quite small and my garden holds vegetables as well as flowers I’ve planted and flowering weeds. Flowers of all kinds are good for attracting beneficial bugs to the garden area. I am currently growing cold weather things like peas, basil, and strawberries (from last year). I will have to wait until the first of June to get the cukes, tomatoes, basil and zucchini into the ground. This type of gardening is experimental, but I am hoping for good results. 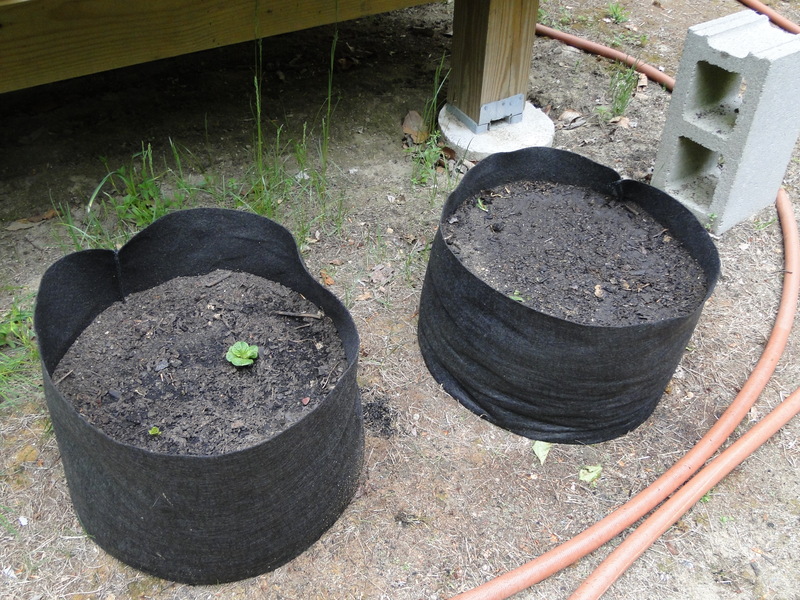 I even bought a large, round fabric bag and will set that up as soon as I get more dirt. I started my own zucchini plants (5 of them!) this year from seeds I saved last summer and I may have to put a couple into that new pot along with some of my tomato plants. After planting my tomatoes and pepper plant, I’m really in the mood to plant more. I agree, planting in pots is a hassle free way of gardening. It makes it less labor intensive and a lot more more fun. I have three male dogs, and I can set the pots up higher than the ground, so they miss the plant when they try to mark it. Another good reason to grow in raised beds and containers!